Hello everyone! I’m back to give you another review. Today’s review is about Cocojojo Castor Oil and Dr Joe Lab Castor Oil. 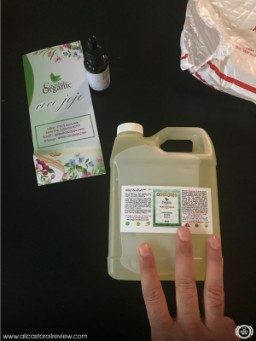 The package arrived a few weeks ago and I was so excited to try the products. These products are 100% organic and free of any harmful chemicals. I made sure to use both products in various ways. 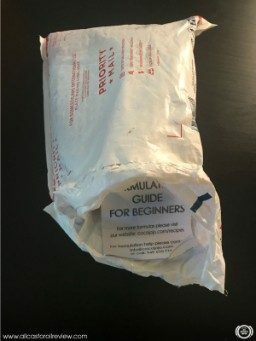 The package arrived a few weeks ago in a durable shipping bag. There are two products inside and both are covered in bubble wrap. 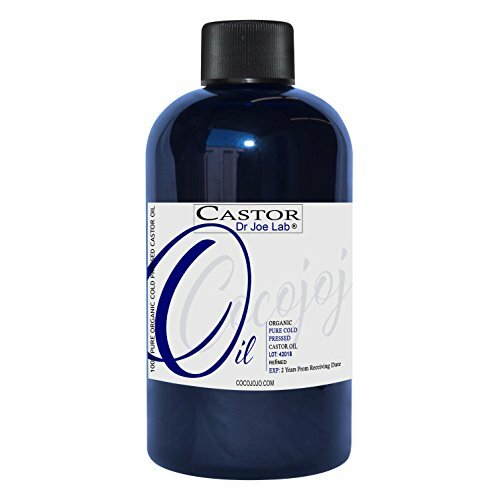 Cocojojo Castor Oil came in a 36-oz plastic gallon while Dr Joe Lab Castor Oil came in a smaller amber glass bottle. 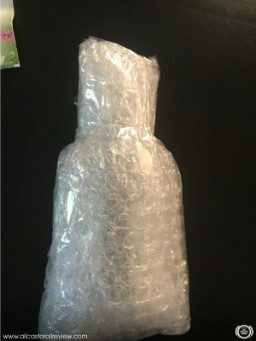 There are several layers of bubble wrap to protect the containers from damage. There is also a Cocojojo brochure for homemade recipes. I loved that Cocojojo Castor Oil comes in a large amount. I used the oil in various ways and there is still a lot of it left. The oil has a long shelf-life and when stored properly, can still be used months after. The screw cap has a tamper-resistant ring that is still intact. The other product, Dr Joe Lab Castor Oil, came in an amber glass bottle. As I’ve told you guys before, I like it when castor oil is stored in an amber glass bottle. 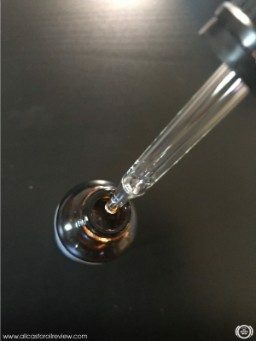 This product has a glass dropper cap, making it easier to take the amount of oil I need without making a mess. I loved the soft and moisturized feeling after I applied the product. The smell goes away quickly too. Before we get on with the review, I know that I’m going to have a hard time trying both products. That’s why I called in reinforcements. I asked my mom and sister to test Cocojojo Castor Oil with me. They didn’t hesitate and even seemed to love the experience. I unscrewed the twist cap and removed the tamper-resistant ring. The twist cap is pretty tight, which is why the product did not spill or leak. The oil has very subtle earthy aroma like crushed nuts. I put a small amount of the oil in a small glass bowl so my mom and sister could try it too. I used a clean glass dropper to put a small amount on the back of my hands. Smoothing it over my skin, I can tell that it is really thick but it doesn’t feel as heavy after application. I loved the soft and moisturized feeling after I applied the product. The smell goes away quickly too. Next, I tried Dr Joe Lab Castor Oil. I opened the bottle and put a small amount on the back of my other hand. 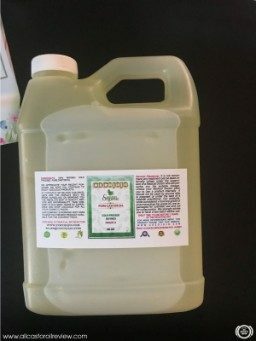 The scent of this oil is a bit stronger than Cocojojo Castor Oil, but it is not unpleasant. It has the same earthy fragrance like raw nuts. The oil feels very smooth on my skin too. It is thick but it didn’t leave any oily residue. It absorbed fast into my skin too. Both oils have a pale yellow color. I used it all over my body when I shower. This homemade scrub leaves my skin looking brighter and feeling softer. Mix castor oil and brown sugar in a small glass bowl. You can add more oil or sugar to achieve the consistency you want. Add essential oils and mix thoroughly. You can use your favorite essential oil blend here. Put in a glass jar and store in cool, dry place. You can make a bigger batch of this mixture and keep it refrigerated to be used within a month. I added 2 drops of lavender oil and pine oil to give the mixture a soothing scent. I used it all over my body when I shower. This homemade scrub leaves my skin looking brighter and feeling softer. It improved my skin tone and texture too. Our family has very dry skin, which is why I asked my mom and sister to try the homemade scrub. I used brown sugar instead of salt because its fine texture is gentler on skin. Brown sugar helps get rid of dead skin cells to reveal the radiant skin below. It stimulates cell renewal as well to prevent skin aging. Sugar is an emollient that can help protect skin from dryness. 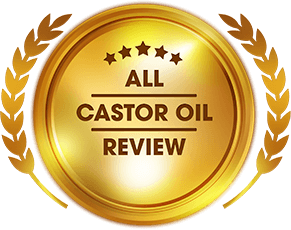 Castor oil’s anti-inflammatory and antibacterial properties help detoxify the skin as well. This mixture gives my skin a youthful glow after I dry off. 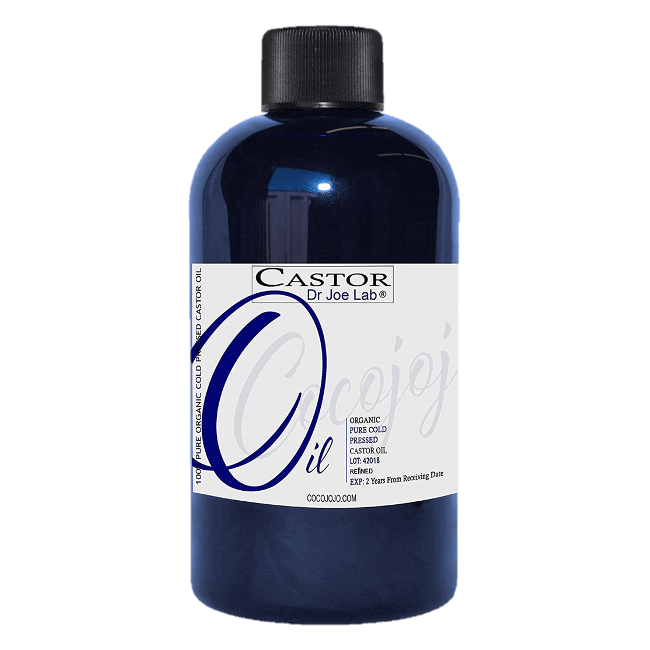 After trying Cocojojo Castor Oil, I moved on to Dr Joe Lab Castor Oil. I used the product for my eyebrows. Eyebrow pencil is one product I’ll never leave home without. I want my eyebrows to look perfect. But I noticed that when brushing my eyebrows, there is often a strand of eyebrow left on the brush. That’s why I applied this oil on my eyebrows every night for two weeks. On the first week, I saw that my eyebrows look thicker when I apply castor oil the night before. The moisture from the oil made the strands look thicker, which gave the appearance of fuller brows. I used the oil for two weeks straight. I took a new mascara wand from my collection and dipped it in the bottle. I use mascara wands because they can reach the roots of each individual hair strands. I brushed my eyebrows from the inner corner while following the direction of growth. Although there is not much of a difference in terms of length, I saw that there are new strands that grew after two weeks. 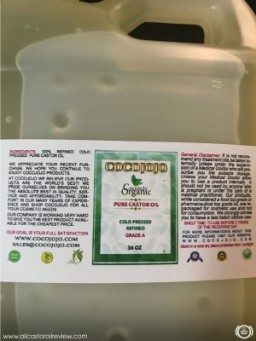 What I liked about Cocojojo Castor Oil is its subtle scent and viscosity. A little goes a long way to cleanse and moisturize my skin. These two products are very versatile. I can use them in various ways whether it’s for skin or hair. What I liked about Cocojojo Castor Oil is its subtle scent and viscosity. A little goes a long way to cleanse and moisturize my skin. I haven’t used it yet for my hair, but I’ll update this review once I do. 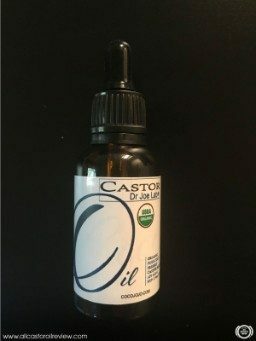 Dr Joe Lab Castor Oil is also a great product for my eyebrows. I loved that it made my eyebrows look thicker every morning. Sometimes, I don’t even have to use brow gels to make my eyebrows look fuller. It doesn’t feel oily when I leave it on overnight. The scent of the oil goes away after a few minutes too. 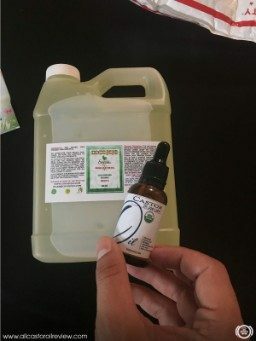 The oil is available in 4 oz bottle too. 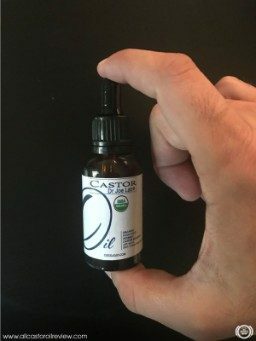 That’s the product I’m going to link in this review because I know you guys will want more of this castor oil. 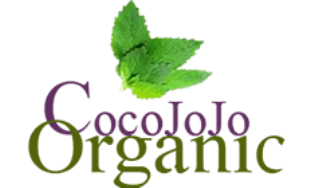 Behind Cocojojo Organic Cosmetics, is a team of experts who believe that organic products are better and safer for the body. They create derma-cosmetic products from botanical ingredients and natural oils. The brand offers a wide selection of products with more than 100 natural oils. They offer products at retail and wholesale quantity. 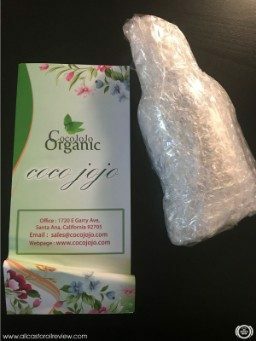 Cocojojo ensures that their products are made of high-quality ingredients. They source these ingredients from ethical and environmental-friendly producers. Each product is not tested on animals and does not contain harmful chemicals or additives. Cocojojo has a dedicated customer support team that you can contact anytime. They accept special requests for labeling and customer order sizes to guarantee your satisfaction.